'I don't really have a word for it,' the quarterback says in his first public comments since the 43-8 loss to Seattle. 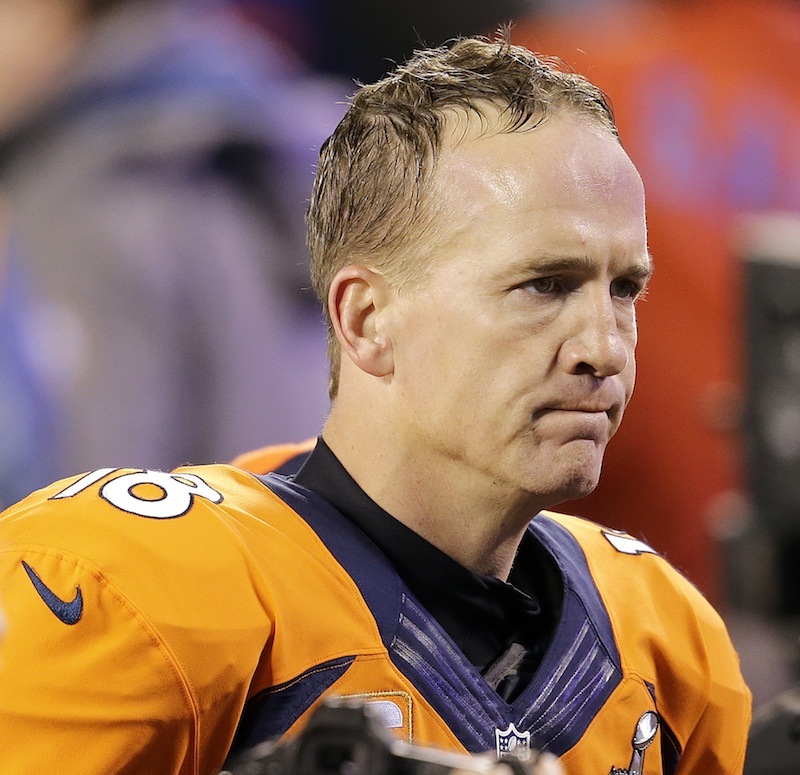 DENVER — Broncos fans may want to move on from Denver’s Super Bowl debacle. Not Peyton Manning. He’s holding on to the heartache to stoke his competitive fire. In his first public comments since the highest-scoring team in NFL history was destroyed by Seattle from the opening snap two months ago, Manning said the Broncos’ 43-8 loss will serve as motivation in 2014. “I don’t really have a word for it. Obviously it was disappointing and we’ll use that to fuel us this offseason and hopefully it’ll make us better,” Manning said Wednesday prior to giving the keynote address at the Boy Scouts of America Sports Breakfast in Denver. The Broncos gather next week for the official start of offseason workouts with a roster that looks a lot different from the one that lost by five TDs to the Seahawks. Gone are Champ Bailey, Eric Decker, Wesley Woodyard, Zane Beadles, Knowshon Moreno and Chris Kuper, whose departures cleared cap space for the additions of DeMarcus Ware, T.J. Ward, Aqib Talib and Emmanuel Sanders. “Eli told me he was excited about DeMarcus leaving his division; he can no longer hit him. And I’m glad he’s on my team,” Manning said of the former Dallas Cowboys pass-rusher who headlined John Elway’s offseason makeover. Manning gave his blessing to the promotion of second-year running back Montee Ball to primary ball carrier. “There’s no question with the loss of Knowshon, who was just nothing short of awesome this past year, and was a great teammate … Montee’s going to have more responsibilities and I think he’s going to answer that challenge,” Manning said. Although Sanders joined Demaryius Thomas, Julius Thomas, Bubba Caldwell and Wes Welker at Manning’s annual passing camp at Duke last week, which the five-time MVP QB called a “good kick-start to the offseason,” the official start of offseason workouts is Monday. 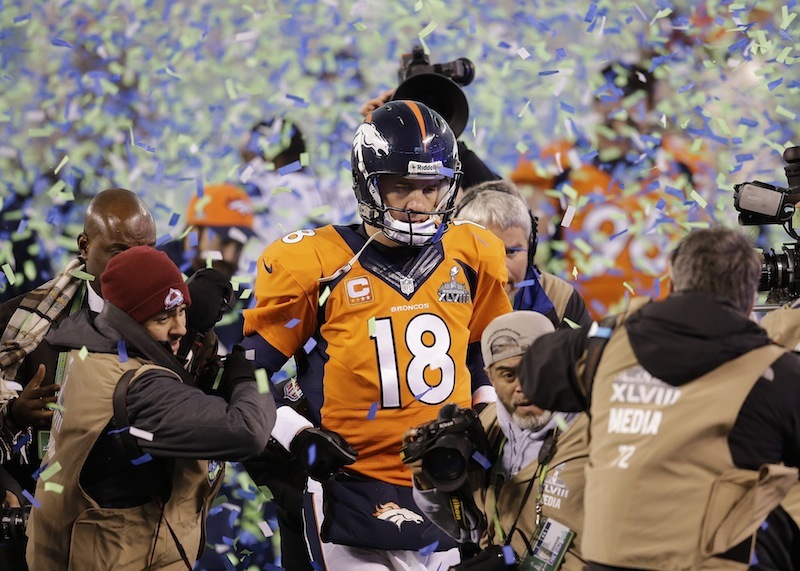 Although Manning and the Broncos will view their loss to Seattle as a scar, much like they did their defeat to Baltimore in the playoffs a year earlier, Manning agreed the gathering will allow the Broncos to begin looking ahead. The Broncos are heavily favored by oddsmakers to become the first team since the Buffalo Bills in 1993 to return to the Super Bowl the year after losing the big game, but the 38-year-old QB who set NFL records by throwing for 55 TDs and 5,447 yards last year knows the challenge facing Denver. Only two teams have lost a Super Bowl and bounced back to win the next one: the 1971 Dallas Cowboys and the 1972 Miami Dolphins.